Hello pretty girls, Wish you all a very Happy New Year 2018.. Hope you all have loads of fun. Well, this is going to be my first post of 2018 , hence I decided to choose a topic which is very close to my heart.. 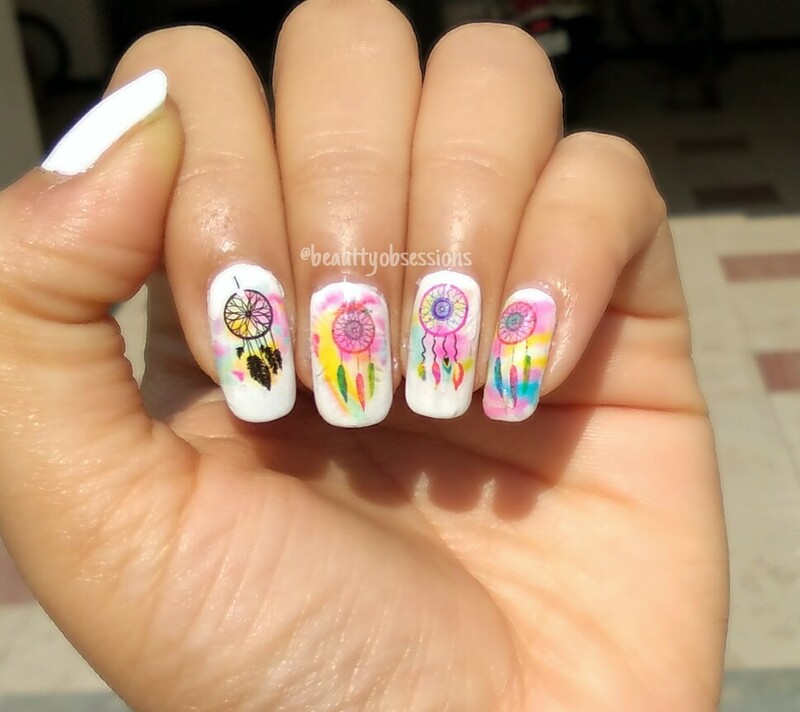 I love doing nailarts and you can say, creating nailarts is my stress buster.. 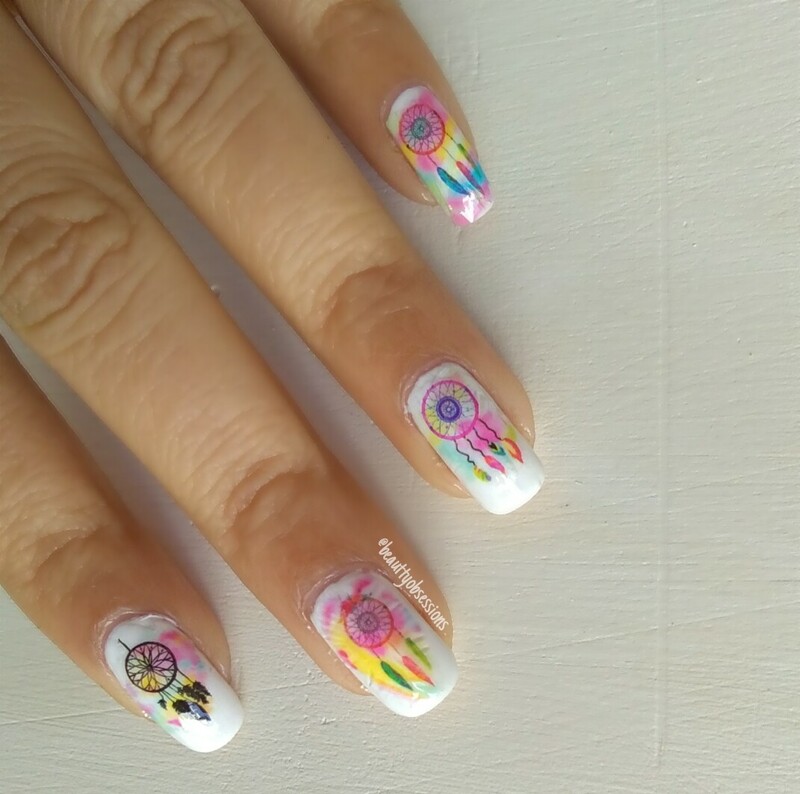 Initially I started drawing my nails as a hobby, now it has become my passion.. So, a nailart post is perfect to start the New Year..
Today's nailart is inspired by beautiful dreamcatcher . 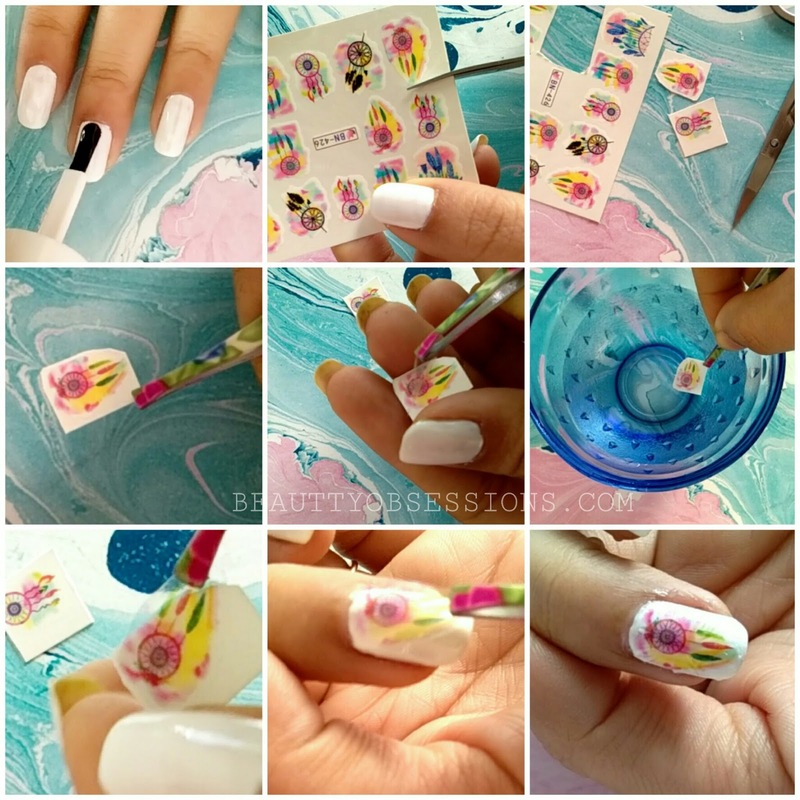 I have used water decals to create this nailart. For the first time I used water decals and trust me it is so much fun to put water decals on nails.. And as you can see, the final outcome is so beautiful. Isn't it ? 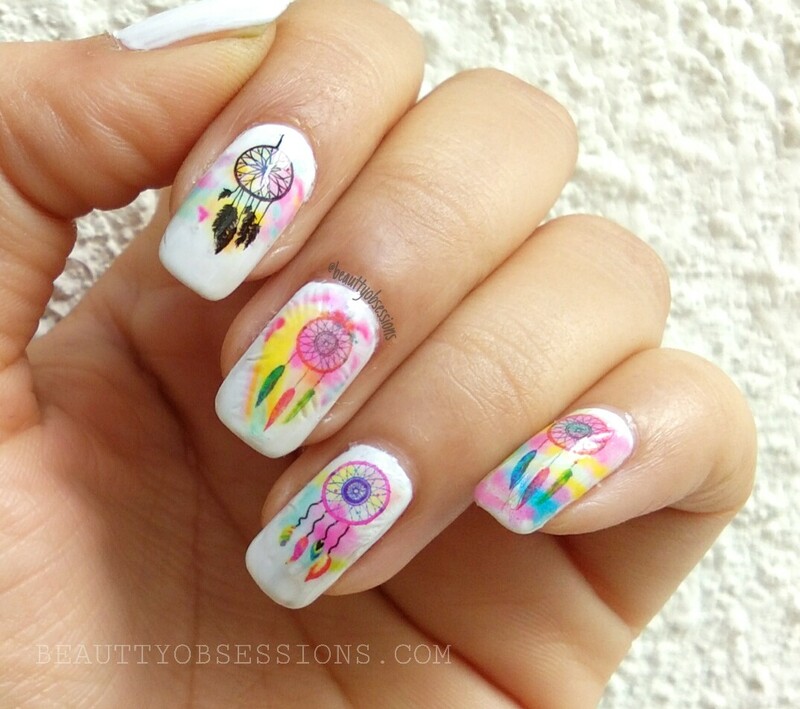 Here I have used the dreamcatcher water decals from beautybigbang . 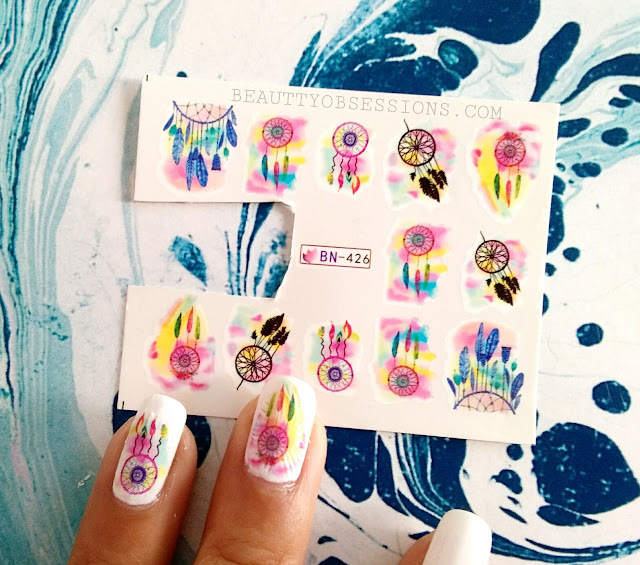 There are 12 decals on one sheet and these are pretty affordable too.. I am in love with the collection at the website.. Except this, you can also find awesome collections in makeup and nails at beautybigbang website.. Use the coupon code SNIG10 to avail extra 10% discount through out the site. 1. First prep your nails and apply a clear base coat ,then apply white polish as base colour and wait till dry completely. Then again apply clear top coat on it and wait till dry. *Refer the below picture for better understanding..
2 - Now take the water decals sheet and cut the particular designs . Now remove the outer transparent film from the cut-out and soak the decal in water for approx. 10seconds. 3 - Then bring the decal sheet out from water and swipe out the decal carefully with the help of a twizer . Now place it on nail properly and carefully. Soak the excess water over it through a tissue paper and as low to stick on nail properly. 4 - Now apply generous quantity of clear top coat and let it dry. Voila.. it's done now.. 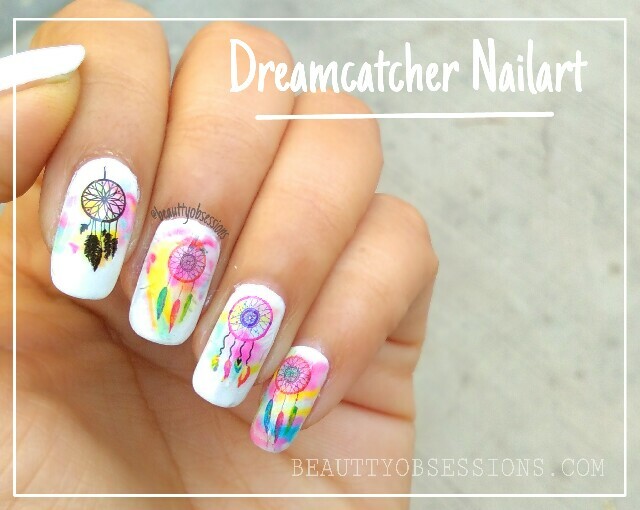 Enjoy some pictures of the beautiful dreamcatcher nailart ..
Must say very good colour combinations. Wow... It's looking beautiful, thanks for easy steps. 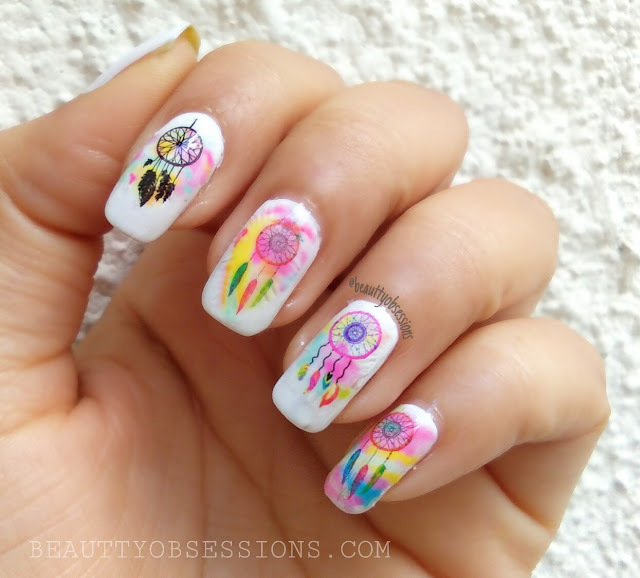 Awesome, I'm loving this nail art, definitely gonna get it and try out! The design is so intricate and beautiful. Love how it is easy to do. I am so in love with this nail art. It's simply beautiful. Thanks for the tutorial. OMG, I personally loved this one, surely giving it a try, thanks for sharing! This looks so beautiful. I didn't know that it can be this easy to apply. I am definitely trying this out.